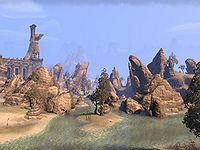 Bangkorai is a region connecting the northern reaches of Hammerfell with the east of High Rock. It stretches from the heavily forested border with Stormhaven in the north, to the blistering heat of the Alik'r Desert in the south. 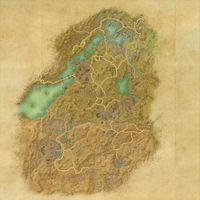 The Bangkorai Pass in the middle of the region marks the border between the region of Ephesus in High Rock, and the Fallen Wastes in Hammerfell. The Reachmen have been causing trouble in the north of region, and there are fears of an Imperial invasion from the south. As a result the populace is unsettled, hoping for aid from either King Fahara'jad in Sentinel, or High King Emeric of Wayrest and the Daggerfall Covenant, to repel the troublemakers. The region of Mournoth in the north is centered around the Bjoulsae River estuary and the port city of Evermore. The climate here is temperate, and the weather switches periodically between sunshine and showers. The witches of Glenmoril Wyrd have camps in the area, and they are becoming increasingly wary of the Dark Witnesses, a Reachman clan who have long desired to see Mournoth returned to the Reach. Ephesus is the narrow central region of Bangkorai, which shares most of the geographical aspects of its northern neighbor. The region stretches between St Pelin's Graveyard in the west, and the ancient ruin known as Arlimahera's Grip in the east. The Knights of Saint Pelin maintains the Bangkorai Garrison in the center of the region, which guards the pass between Ephesus and the Fallen Wastes. Even when the pass is closed, it is possible to travel between these two regions using the Sunken Road. Although traditionally part of Hammerfell, the Fallen Wastes are currently ruled from Evermore like the rest of Bangkorai; however, sightings of the Seventh Legion near Hallin's Stand have lead to fears of annexation by the Imperials. The Gates of Craglorn — A border crossing in eastern Bangkorai, leading to the region of Craglorn. Nchu Duabthar Threshold — A remote valley in the center of Bangkorai visited during the Daggerfall Covenant quest The Parley. The Far Shores — A realm of Aetherius to which the souls of Redguards travel upon their death. Beyond the Call: Discover what the Dark Witnesses have been cultivating in Northglen. Destroying the Dark Witnesses: Meet the Glenmoril Wyrd at Jackdaw Cove. Heart of Evil: Drive the hagraven and her Dark Witnesses out of Mournoth. Hallin's Burden: Meet the resistance in Hallin's Stand. The Lion's Den: Find out who let the Seventh Legion into Hallin's Stand. A Thirst for Revolution: Save the grandeya of Hallin's Stand from execution by the Seventh Legion. The Shifting Sands of Fate: End the Imperial occupation of Hallin's Stand. Searching for the Searchers: Search for a group of Knights of Saint Pelin who were investigating the Reachmen at Jackdaw Cove. Imperial Curiosity: Inform Commander Ahla about the presence of Imperials at the Hall of Heroes. Freedom's Chains: Investigate a village mayor who is fabled to be able to cure any disease. The Last Spriggan: Try to prevent a spriggan from becoming a lurcher. Mistress of the Lake: Prevent forbidden knowledge from falling into the wrong hands. Sunken Knowledge: Help the Primeval Seekers overcome the nereid and her disciples. The Water Stone: Help the Rain Disciples overcome the dremora and her seekers. The Will of the Woods: Help the Sentinel of Viridian Woods. Present in Memory: Reunite a scholar and his guide. Publish or Perish: Help an Imperial scholar find some other research to "cite". The Waking Darkness: Discover why the dead have risen from St. Pelin's Graveyard. We Live In Fear: Locate a wayward Khajiiti scam-merchant. Back in Time: Recover a stolen book for a hapless mage. The Covenant Infiltrator: Rescue a Covenant spy and recover vital Intel from Imperial hands. The Mystery of Razak: Discover what the Imperials' are searching for at Razak's Wheel. The Returned: Search for survivors of a farmstead fire. Rising Against Onsi's Breath: Rescue the Imperials' captives from the mine workings. To Aid the Enemy: Rescue Imperial soldiers who were lured into some Ayleid ruins. Urenenya's Lament: Learn what happened to the Ayleid Princess Urenenya. This page was last modified on 12 June 2018, at 03:48.